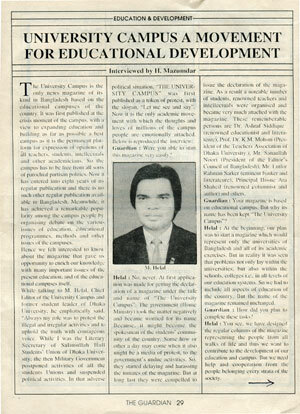 The University Campus is the only news magazine of its kind in bangladesh based on the educational campuses of the country. It was first published at the crisis moment of the campus, with a view to expanding education and building as fas as possible a best campus as it is the permanent platform for expression of opinions of all teachers, students, intellectuals and other academicians. So the campus has to be free from all sorts of parochial partisan politics. Now it has entered into eight years of its regular publication and there is no such other regular publication available in Bangladesh. Meanwhile, it has achieved a remarkable popularity among the campus people by organising debate on the various issues of education, educational programmes, methods and other issues of the campuses. Hence we felt interested to know about the magazine that gave us opportunity to enrich our knowledge with many important issues of the present education and of the educational campuses itself. While talking to M Helal, Chief Editor of the University Campus and former student leader of Dhaka University, he emphatically said, "Always my role was to protest the illegal and irregular activities and to uphold the truth with courageous voice. While I was the Literary Secretary of Salimullah Hall Students' Union of Dhaka University, the then Military Government postponed activities of all the students unions and suspended political acitivities. In that adverse political situation, "The University Campus" was first published as a token of protest, with the slogan, "Let me see and say". Now it is the only academic movement with which the thoughts and loves of millions of the campus people are emotionally attached. Below is reproduced the interview. Guardian: Were you able to start this magazine very easily? Helal: No, never. At first application was made for getting the declaration of a magazine under the title and name of "The University Campus". The government (Home Ministry) took the matter negatively and became worried for its name. Because, it might become the spokesman of the students' community of the country. Some how or other a day may come when it also might be a media of protest, to the government's undue activities. So, they started delaying and harassing the inmates of the magazine. But at long last they were compelled to issue the declaration of the magazine. As a result a noteable number of students, renowned teachers and intellectuals were organised and became very much attached with the magazine. These rememberable persons are Dr. Ashraf Siddique (renowned educationist and litterature), Prof. Dr. K. M. Mohsin (President of the Teachers Association of Dhaka University), Mr. Sanaullah Noori (President of the Editor's Council of Bangladesh), Mr. Lutfor Rahman Sarker (eminent banker and litterature), Principal Hosne Ara Shahed (renowned columnist and author) and others. Guardian: Your magazine is based on educational campus. But why its name has been kept "The University Campus"? Helal: At the beginning, our plan was to start a magazine which would represent only the universities of Bangladesh and all of its academic exercises. But in reality it was seen that problems not only lay within the universities, but also within the schools, colleges i.e. in all levels of our education systems. So we had to include all aspects of education of the country. But the name of the magazine remained unchanged. Guardian: How did you plan to complete these tasks? Helal: You see, we have designed the regular columns of the magazine representing the people from all walks of life and thus we want to contribute to the development of our education and campus. But we need help and cooperation from the people belonging every starta of the society. Guardian: What is your main objective? Helal: We want to grow conciousness, develop positive values and attitudes of the campus people. We want to make hard protest against all harmful and ill activities which are every now and then happening in the campuses and to identify the problems of education, students, teachers and other campus people with a view to making suggestions for solving those. Through this process, we have organised all campus people this magazine, where all can express their opinions spontaneously and enjoy freedom of speech. We wish to convert this academic movement into a social movement. Guardian: How far have you achieved your objectives? Helal: We have a long term plan. Hence, this is not the time to evaluate our task. But I think, the readers of the magazine can only opine about our performance. We are moving forward fighting the adverse situation and are always hopeful for our future and achievement. Guardian: You are working very closely with our educaiton and campus for al long time. How do you feel about the quality of educaqtion of our country? Helal: The overall quality of education of our education system is not satisfactory. I think, irregularities of our educational system, irresponsible and commercial mentality of maximum teachers who do not accept the teaching as a noble profession, are liable for this situation. Guardian: Why the teachers are doing so? Helal: Teachers are doing so due to the existing socio-economic conditions prevailing in the country. Overall social and moral degradation have adversely affected our teachers' community also. Now most of them are not much interested in their profession rather interested in national and campus politics. Guardian: What are the reasons behind the instability of the academic campuses of Bangladesh? Helal: There are so many socio-economic and political reasons. But terrorism is the main threat to the congenial atmosphere of the campuses. It also creates session jam which further throws the younger generation into frustration and instability.